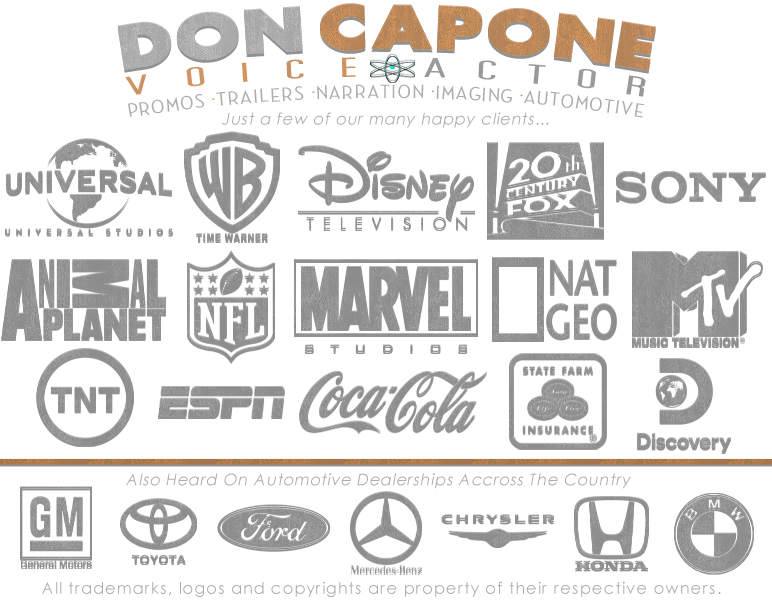 Voice Actor Don Capone is a professional Voice Talent. A Movie Trailer Voice Actor for your theatrical film production. Looking for a voice actor for your video or audio production? Well hello there... We are a professional voice over actor and have been in the voice talent business for over 27 years. With a Hi-Def digital audio workstation that can deliver the best voice overs with clear audio for your production. We can even help if your looking for female voice actors. If your looking for our voice acting rates, we always try to work with your budget. But rate factor all depends on the length of the voiceover scripts, market size, whether its fully produced with effects and music or a dry read... this all plays a part of the final price. Professional Voice Actors can make your video or audio production come to life. When looking to hire a Voice Actor you must decide the type of voice that best suits the project. We know finding the best voice actors can be a challenge. So many to choose from can be a dizzying experience. It all comes down to how good can the voice actor act! Acting is the keyword... being believable and pulling the target audience in. Anyone can read a voice over script... But being able to act and becoming the character is the key to a successful voice over actor. We have done thousands of voice acting jobs in the past 25 or so years. So if your looking for voice actors with deep voices, friendly, warm, powerful, hard sell or over the top, New York accent or a Cowboy voiceover... or maybe your looking for that "Voice Of God" like in a movie trailer voice over... We can make it happen! Celebrity voice actor Morgan Freeman, Jeff Bridges, Sam Elliott, Mike Rowe, David Attenborough are just a few that we personally enjoy listening to. We are a professional voice actor. This is all we do for a living. Providing commercial voice overs for radio, television, advertising agencies, directors, producers, casting agents, ad agencies, animation houses, voice over agents, voice talent agencies, cartoon voice overs, independent film studios and all types of voice acting for all types media. Your files can be recorded in either .mp3, .wav or .aif and delivered by email, FTP or a direct download link. Live voice actor sessions available at extra cost through preferred Source Connect or an ISDN bridge connection. Phone patch is available for an extra premium. Voice over auditions? Well... You should be able to tell if I'm right voice actor for your production by listening to our voice over demos. BUT hey... if your still not sure... I'll kick one back to ya. Professional Voice Actor Don Capone.